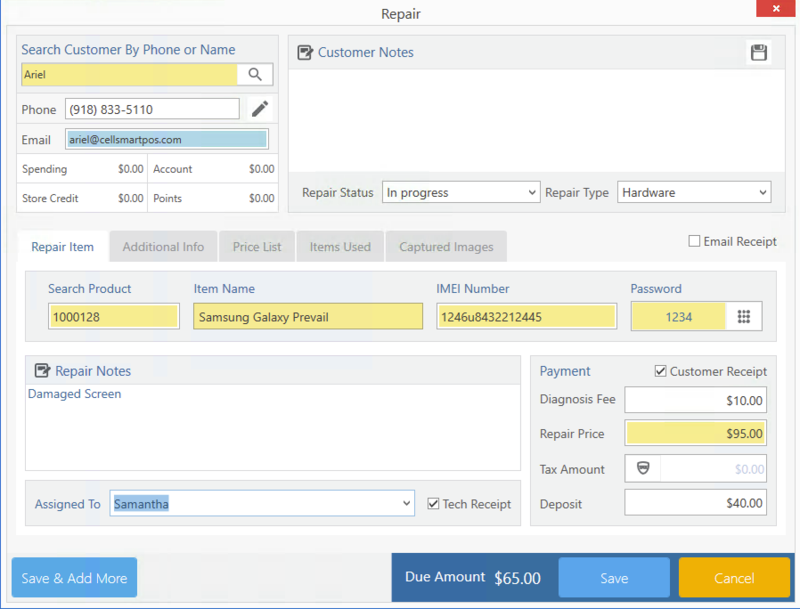 CellSmart POS allows you to take repairs and create repair tickets for your customers with necessary info such as IMEI, price, password and etc. You can keep track of how many repairs are done, pending or can't be fixed. Keep track of how long a phone has been waiting for a customer to pick up, send your repairs to a third party, allow your clients to loan a phone while their own is being repaired, store pictures of the damaged devices and store every detail regarding you repair in the Repair's module. Click on the List tab, the fourth option from the left on the menu bar at the top. Click on the Repair icon from the icon menu. Select your repair from the list of repairs. Click on the payment button from the options menu. In the repair payment window, enter the payment amount in the pay now field at the bottom. Click on the Edit button from the options menu. Select whether the repair was fixed, not fixed or working by clicking on the small drop down menu. Then, click on the Truck icon from the options menu to deliver/close the repair. When the repair prices that you have entered matches the price which was needed for the repair, you are ready to deliver the repair. To deliver the repair you may click on the deliver button. The software will ask you to close the case, you may click OK and the repair will be closed, with a repair receipt printed. Click on this button and a repair message window will pop-up . The window will have the repair information listed such as the repair ID number, customer's name, repair price and the paid amount. Before you send out the text, you must have a prepaid balance of at least $.02 since each text will cost you that amount of money. Edit your text if necessary and make sure the customer's phone number is valid. Click on Send message to send the message. Click on the Captured Images tab. If you're uploading a picture from your PC click on the From Computer icon on the left and if you're taking a picture using your camera click on the the Camera option on the right. If you're uploading from computer, select the location of your file and click on Open. 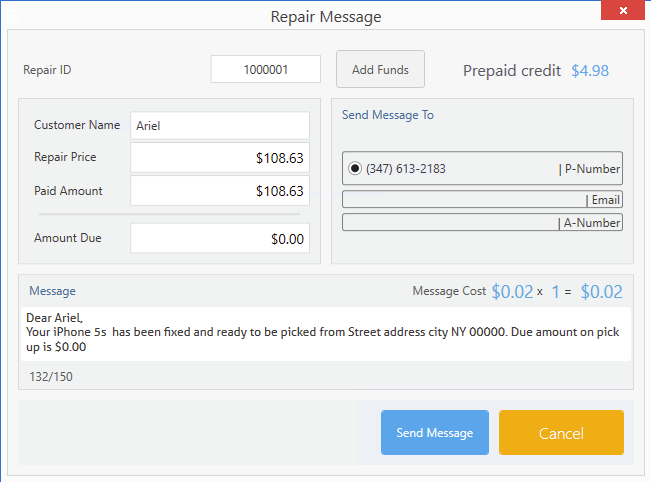 The Repair item tab allows you to enter information such as the Repair device's information, repair notes, repair payment information such as diagnosis fee, repair price, tax amount, repair deposit. In this tab you can enter an alternate contact number of the client and select the carrier associated with it. Enter the loaner phone information, and select the applied repair device's conditions from the conditions given. The price list tab allows you to select different Repair issues of the device being repaired. When you select a device to repair, the repair issues related to that device will be listed under the price list tab which you can select. Each repair issue under price list has its own price, and the repair price will be determined based on the price list amount. The Item used tab provides you with the repair price detail, third party repair entries, inventory used in the repair and other necessary information. This tab provides you with the repair price amount that is needed to be entered based on the repair price you entered when creating the repair. It also tells you the amount that you have entered currently and gives you a bar representation of your repair amount progress. Inventory Used Tab: This tab allows you to enter the repair parts that are being used from your inventory to fix the repair device.